One of my favorite things to do to get ready for spring and summer is to fix-up my yard. In the warm months, my family likes to use the backyard as an addition to our home. We eat many meals, read, and relax outside as much as we can. Creating a beautiful environment with pretty décor makes the yard a more inviting place and encourages everyone to get outside and enjoy the nice weather. One charming way to make your backyard feel like a retreat is to hang sweet & colorful ornaments from tree branches. 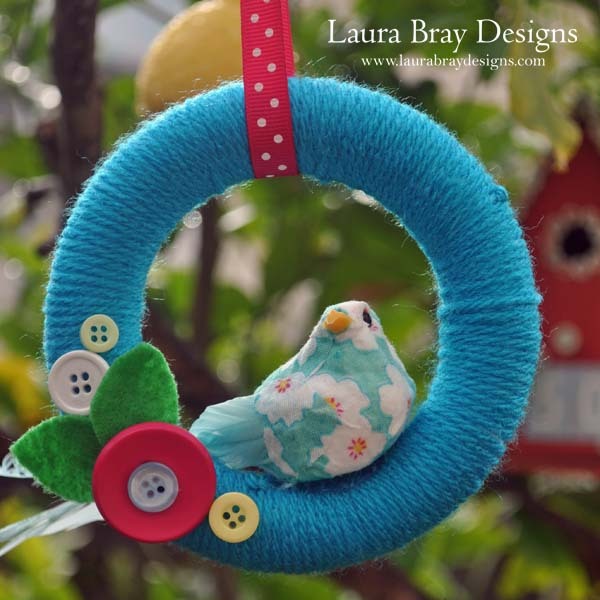 This mini spring bird wreath will bring joy and color to your yard. This spring door wreath craft is also a nice way to bring a touch of nature indoors or use it to decorate a special gift. 1. Wrap yarn around the Smoothfoam wreath and secure the ends to the back with glue. 2. Cut leaves from green felt. You only need a little, so this is a great project to use up small scraps. 3. Arrange leaves and buttons around the base of the wreath to represent flowers. Use my project photo as a guide for placement, or create a placement that is pleasing to you. 4. Glue buttons and leaves in place. Glue the bird to sit inside the wreath. 5. Tie a ribbon around the top of the wreath to use as a hanger. 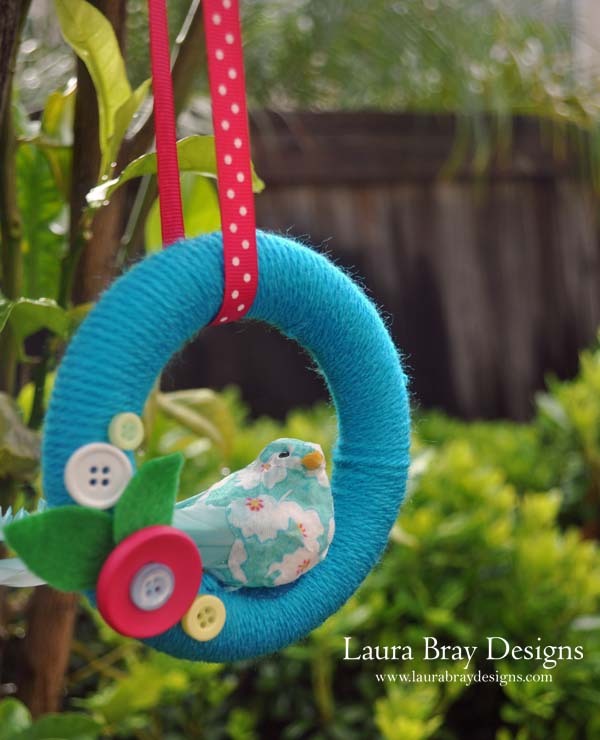 This entry was posted in Home Décor Crafts and tagged Animals, Blue, Garden, Special shapes, Wreaths by Laura Bray. Bookmark the permalink. I’m a professional craft designer and lifestyle blogger. I try to live my life with intention and fill it with creativity and good food. I wish I could say I channel Lucille Ball, but I’m really more like Ethel.